The Colts will give the four-time Pro Bowler a two-year, $24 million contract, a source told ESPN’s Adam Schefter. 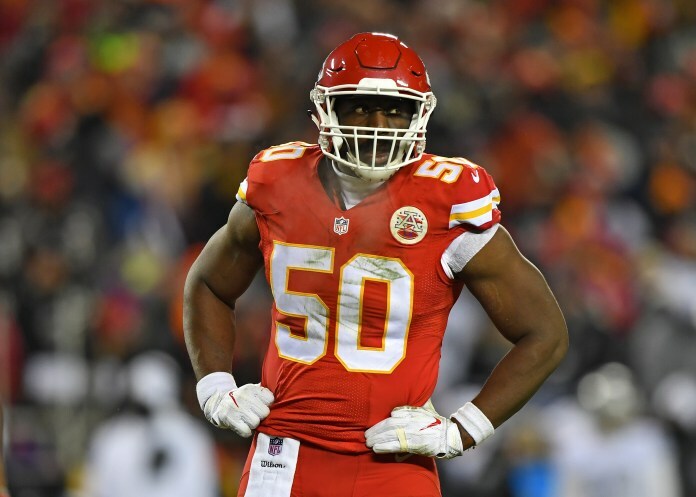 The Chiefs last week released Houston, making him a free agent, after no team was willing to work a trade and pick up the $15.25 million base salary he was due this season. Houston, who turned 30 in January, joined the Chiefs as a third-round draft pick (70th overall) from Georgia in 2011. He quickly showed his pass-rush ability by getting three sacks in a game against the Bears as a rookie. He had 22 sacks in 2014, missing the NFL record by a half-sack. Houston hasn’t come close to that standard since. His best sack total in the past four seasons is 9.5 in 2017. Houston has 78.5 career sacks, fourth on the Chiefs’ all-time list. The Colts landed their best pass-rush threat since Robert Mathis had 19.5 sacks in 2013 in Houston. He’ll help a defense that finished tied for 19th the NFL in sacks last season with 38 while not having a legitimate pass rusher. In 2015, Houston signed a six-year contract worth $101 million, making him at the time the highest-paid defensive player in NFL history. Houston was more than just a pass-rusher for the Chiefs. He was an excellent all-around player who defended the run well. He was a first-team All-Pro selection in 2014. And now he’s got a new team.